Cinnamon Bay Plantation on lush, tropical St. John was the ideal Caribbean island getaway: Or so it seemed. But for distinguished Harvard economist Henry Spearman, long overdue for R & R, it offered diversion of a decidedly different sort and one he'd hardly anticipated: murder. It couldn't have happened to a nicer guy. Prickly and priggish, Gen. Hudson T. Decker (Ret.) might have been a Cinnamon Bay regular, but he'd managed to alienate fellow guests and a lot of townspeople over the years. Suddenly, before the local inspector has assembled a suspect list, there is a mysterious drowning and a second murder, this time a former U.S. Supreme Court justice. Prime suspects abound: a liberal professor of divinity, a vengeful wife, an alleged girlfriend, and a handful of angry local activists. While the island police force is mired in an investigation that leads everywhere and nowhere, the diminutive, balding Spearman, who likes nothing better than to train his curiosity on human behavior, conducts an investigation of his own, one governed by rather different laws--those of economics. Theorizing, hypothesizing, Spearman sets himself on the trail of the killer as it twists from the postcard-perfect beaches and manicured lawns of a premier resort to the bustling old port of Charlotte Amalie to the densely forested hiking trails with their perilous drops to a barren, deserted cay offshore. 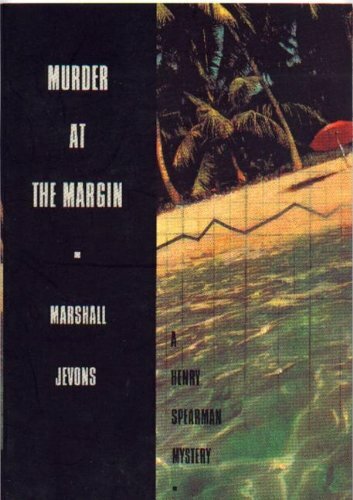 Now available in a new critical edition, Marshall Jevons's Murder at the Margin was first published in 1978, when it marked the debut of Henry Spearman. Spearman relies on economic thinking to solve crimes--a distinction that places him in the pantheon of such fictional investigators as Father Brown, Miss Marple, Hercule Poirot, and Rabbi Small.